Domain name buyer ran into trouble, so Bitcoinist leased BTC.com and has launched it as a site for cryptocurrencies. BTC.com launched as a cryptocurreny information site after a long term lease deal for the domain name. The $1 million sale of BTC.com last year raised a few eyebrows, even in the bitcoin-fueled crytocurrency bubble. The timing of the domain name sale was great…for the seller. Buyer GAWMiners quickly ran into financial (and perhaps other) trouble. But a UK company stepped in to carry the torch and develop the domain name. Bitcoinist LTD leased the domain name from GAWMiners in a deal lasting until 2018. 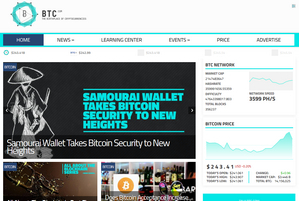 It launched BTC.com today as a news site for cryptocurrencies. BTC.com includes news, user forums and beginners guides. Bitcoinist is also looking to license subdomains, such as exchange.btc.com, mining.btc.com, and wallet.btc.com. Three letter domain name sells for seven figures. Domain name brokerage firm Domain Guardians has brokered the sale of the BTC.com domain name to a bitcoin company. GAWMiners, seller of bitcoin mining machines, is the buyer. This is an example of how a three letter domain name can gain significant value based on new popular terms. I’m a bit shocked by the price. It makes me wonder how much Bitcoins.com would have sold for in the recent Heritage Auctions domain name auction. The domain name was pulled at the last minute for legal reasons related to the Mt Gox bankruptcy. The most recent public whois for BTC.com shows the owner as Brain Trust Company in Osaka, Japan.